With Amazing Spider-Man officially “ending” at issue #700 two weeks ago, and the debut of a brand-new Spider-Man title this week, Superior Spider-Man, I thought now was as good of a time of any to comb through 700 issues of ASM (plus the annuals) and highlight some of my favorite individual issues. Let me preface things by saying that this is a personal top 10 list. I’m sure most of you are well aware of the “usual suspects” that are generally considered the greatest Spidey stories of all time, and while some of those stories will make the cut, I also wanted to make sure I considered other stories. The way I ultimately chose my top ten was by determining those comics with the most personal significance to me – i.e. those that made me appreciate the Spider-Man/Peter Parker character more and those that made me cherish the comic book medium in general. Also keep in mind I’m taking individual comics, which may create some confusion when I inevitably talk about an issue that’s part of a larger, more famous arc. In other words, consider this a desert island list – 10 issues of ASM that if I had to destroy the rest of my collection, I could not live without these at my disposal. I’m going to shoot out these posts over the next three weeks before resuming Chasing Amazing’s regularly scheduled programming (whatever that may be). Amazing Spider-Man #18 (script by Stan Lee, art by Steve Ditko): Aunt May’s speech to Peter about Parker’s being tougher than they appear is a seminal moment for the character, transforming her from an elderly albatross to someone who was truly worth fighting for. 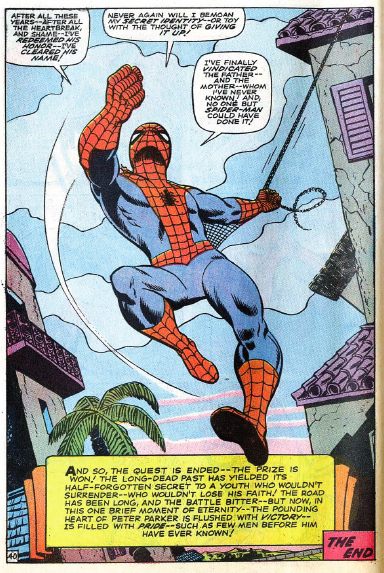 Amazing Spider-Man Annual #5 (script by Stan Lee, pencils by Larry Lieber, inks by Mickey Demeo): An emotional issue where Peter Parker discovers the origins of his parents and clears their name as “traitors” to the United States. 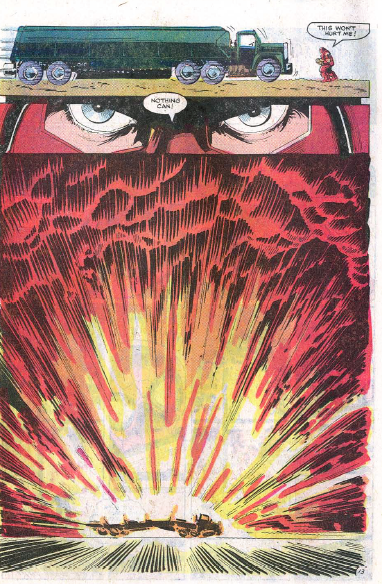 Plus he does battle with one of Marvel’s greatest rogues in the Red Skull. 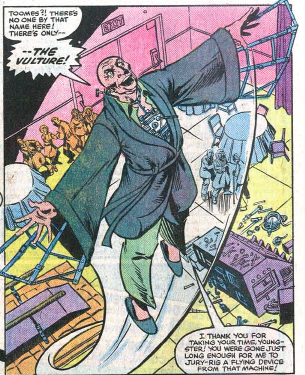 Amazing Spider-Man #224 (script by Roger Stern, pencils by John Romita Jr., inks by Pablo Marcos): Stern tackles one of his favorite rogues in the Vulture and does a marvelous job taking an otherwise dated character and fleshing him out so readers actually care about him and his interactions with Spider-Man again. This would become a specialty of the Stern run. Amazing Spider-Man #238 (script by Roger Stern, art by John Romita Jr.): Sacrilegious as this sounds, I actually think the bulk of the story in this issue is a little plodding and meandering, but then Stern brings it home when he step-by-step introduces readers to the Hobgoblin, giving the new character so much gravitas and kicking off one of the more interesting arcs in Spidey history. Amazing Spider-Man Vol. 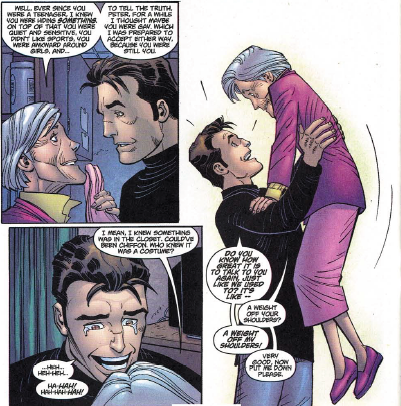 2 #38 (script by J. Michael Straczynski, art by John Romita Jr., inks by Scott Hanna): After years of speculation, Aunt May finally discovers and confronts Peter Parker about his secret identity as Spider-Man. At one point Peter mentions that the conversation is a weight off his shoulders and for readers who have dealt with this tension since 1962, the feeling is mutual. In the second part of a two-issue arc, Spider-Man engages in a battle that went on to define his character and fortitude for an entire generation of fans. In what could have been just another lazily written crossover featuring a villain from the popular X-Men universe, Stern crafts a fantastic, a high-stakes story that definitely demonstrates that there’s no quit in Spider-Man. Seriously, there’s a part of me that never got over the fact that Spider-Man didn’t have this battle with someone more associated with his universe. Maybe that’s why I ultimately didn’t rank this higher. And still, it’s equally impressive that Stern grabbed Juggernaut, a guy with minimal if any history with Spider-Man, and pulled off such a powerful and revered story. 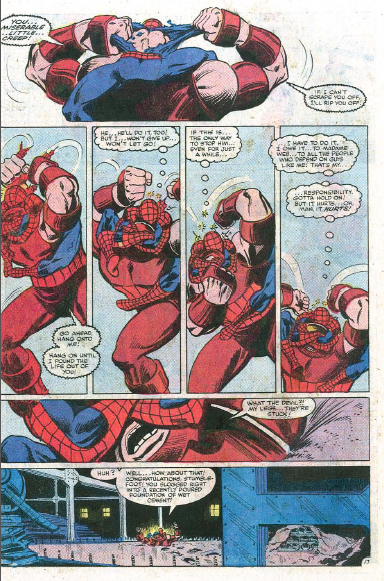 Juggernaut’s primary super power is also an excellent contrast for Spidey. The Juggernaut is driven by nearly endless momentum, so when he says “nothing can stop the Juggernaut,” that’s not just a platitude. Nothing can stop him, because by definition, his momentum continues to drive him, regardless of what gets in his way. Meanwhile, Spider-Man has superhuman speed, strength and reflexes, but what’s continually made him a transcendent character is his “must succeed at all costs” attitude. This character trait is born from the earliest appearances of Spider-Man, when he dedicates his life to righting the wrong he caused when he ignored his Uncle’s sage advice, “with great power comes great responsibility,” leading to Ben’s death. So while Spider-Man can physically be stopped by a brick wall or a body of water, his refusal to quit drives him to overcome the odds. So in the case of Juggernaut versus Spider-Man you have the unstoppable object versus the unstoppable spirit. I chose ASM #230 over the preceding issue that kicks off the arc because I honestly felt this was the comic where Spider-Man showed just how persistent he was in an effort to take down an adversary. After throwing everything including a gas tanker at the Juggernaut and still not succeeding, Spider-Man eventually has to rely on his intellect (and a little bit of luck) to “win,” which is one of the attributes that has long separated Spider-Man from the more senior circuit of superheroes in the comic book universe. And still, Spider-Man once again never gets everything he wants, as Madame Web has developed amnesia thanks to the Juggernaut’s dirty work. While I think the story obviously suffers a bit being read in isolation and without its companion ASM #229, Spidey’s mostly triumph here makes it effectively standalone enough to be in my top 10. I suspect this will be the first of a few controversial choices in this list (as every Spider-Man fan from the early 80s admonishes me for picking a Venom story over “Nothing Can Stop the Juggernaut”). True, ASM #230 is a far more historic issue of Amazing Spider-Man, but like I already mentioned, this is a personal list, filled with issues that made ME come to love Peter Parker and Spider-Man. And this is one of my favorite stories from a period where I really started to embrace comic books and collecting. So … there! But seriously, it’s worth explaining that any young male reading Marvel comic books in the early 1990s was very likely a fan of the symbiote. Before he became a brain-eating caricature of himself and before he spawned a number of serial killing “children,” Venom was probably the most imposing villain in the Spider-Man universe – a true threat in a way Doctor Octopus and Green Goblin were in the years following their introductions in the 1960s. Every Spider-Man/Venom confrontation felt like an “event,” and because Venom was present as such a lethal force, Spider-Man rarely, if ever, took a decisive victory against him, leaving things open for more stories down the road (side note: it’s killing me to think that Venom has been kicking around for 25 years. He still feels like a totally “new” and different character for me). ASM #347, another “part two” of a two-comic arc, incorporated a fascinating twist in the Spider-Man/Venom cat-and-mouse-game. 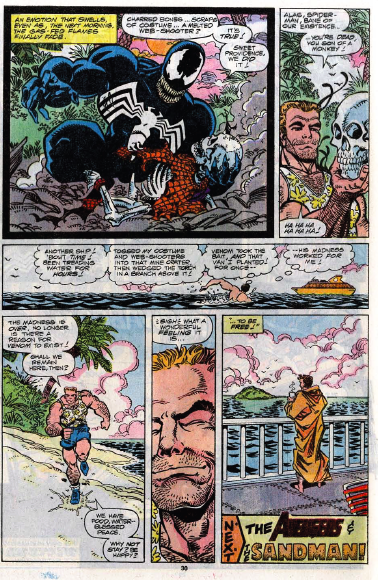 Learning from his mistakes from previous confrontations, Venom knocks Spider-Man out and kidnaps him to a deserted island filled with deathtraps. From there, Venom plans to hunt Spider-Man for sport, killing him once and for all. 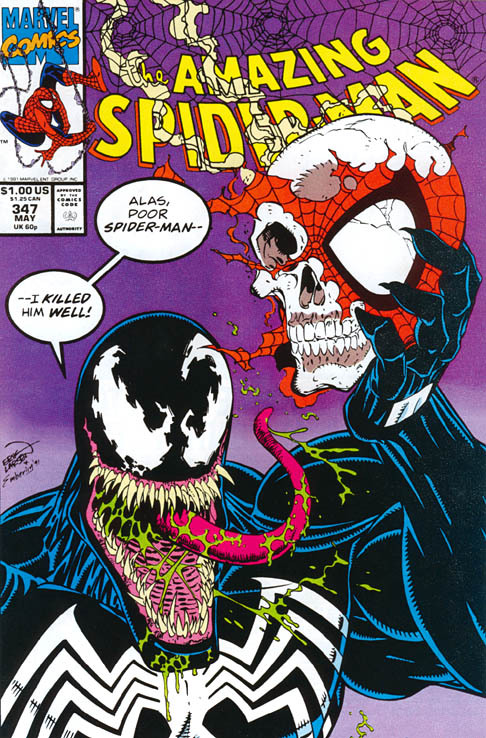 It was a situation where it appears that Spider-Man is finally finished – but since this was done in an era before Marvel found it reasonable to have the hero’s chief adversary kill the good guy off and assume his identity, I was totally engaged by the comic to keep reading and see how Peter would survive Venom’s personal island of Hell. In the end, Spider-Man fakes his own death, even leaving behind a skeleton dressed in red and blue tights, producing one of the great panels of the era – a smiling, content Eddie Brock letting go of his hate because his sworn enemy has finally been vanquished. If Marvel decided to end the story of Brock/Venom here, it would have been a totally suitable, believable conclusion to a more than 5-year on-again, off-again story. Instead, Venom was brought back, dozens of more times and watered down to the point where he’s the star of his own comic now, but with high school bully Flash Thompson wearing the symbiote (not that I don’t like Venom, just pointing out how absurd that sounds 25 years after the fact). The comic is a perfect representation of early 90s Marvel and Spider-Man – bombastic, absurd and fun. I’ve found over time that Michelinie rarely gets the respect he deserves as an ASM scribe, perhaps because he’s better remembered for his run on Iron Man. 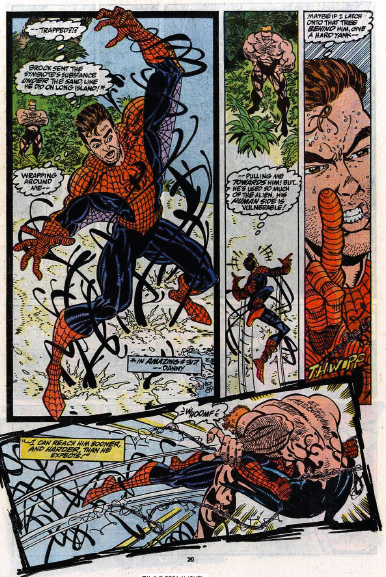 He also had the added “problem” of working with a rock star artist in Todd McFarlane during the peak of his run on ASM. 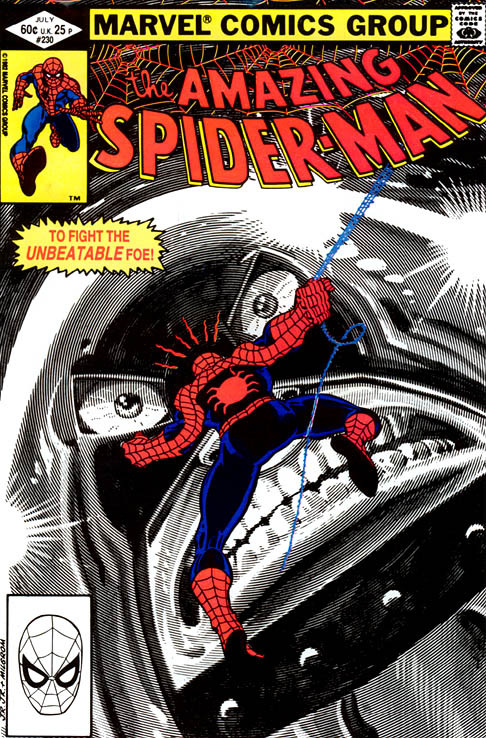 Obviously, ASM #347 is not a McFarlane book, and while I was never the biggest fan of Larsen, the comic’s cover is extraordinarily memorable for me. I still remember the first time I was visiting a friend’s house in junior high and I stumbled upon this comic while thumbing through his collection – the slimy tongue, Spider-Man’s skull and the quote from Hamlet. This was the kind of stuff that made me a comic book fan: heroes overcoming larger than life villains and improbable odds. If a 13-year-old-boy couldn’t escape into a world like that, then I guess he was never going to be a fan of comic books.